Completely vegitarian pizza using portobello mushrooms as a base. The lemon and salt can be added "to taste," you don't really have to follow the measurements listed for them. This Healthy Portobello Pizza recipe is perfect if you're trying to incorporate more veggies into your diet, AND it satisfies pizza cravings. A two-fer!!! This recipe was originally posted on bodyrock.tv Completely vegitarian pizza using portobello mushrooms as a base. The lemon and salt can be added "to taste," you don't really have to follow the measurements listed for them. Heat up the olive oil in a non-stick frying pan. Chop up the onion into small pieces, then add it to the pan and stir until it's slightly brown. Dice up the tomatoes, garlic cloves, and leek, and add them to the pan with the onions. Saute until the ingredients are soft. Add a pinch of salt to the mixture and stir. Begin preheating the oven at 400 degrees. Chiffon the basil leaves (chop them up) and add to the pan. Stir. 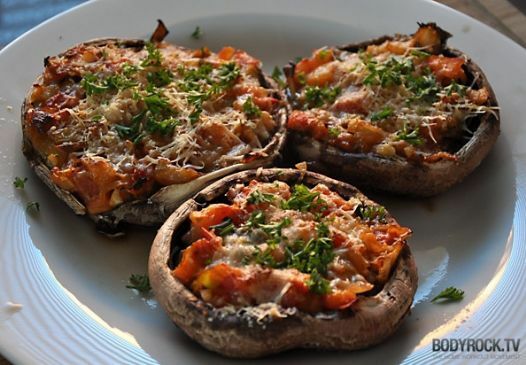 Spray olive oil on a baking sheet and place the portobello mushrooms on the sheet, bottom side up with stems removed. Add the mixed ingredients form the sauce pan into each mushroom and top with the grated parmesan cheese. Place the baking sheet into the oven and bake for 12 minutes at 400 degrees. Sprinkle the pizzas with the fresh (or dry) parsley.